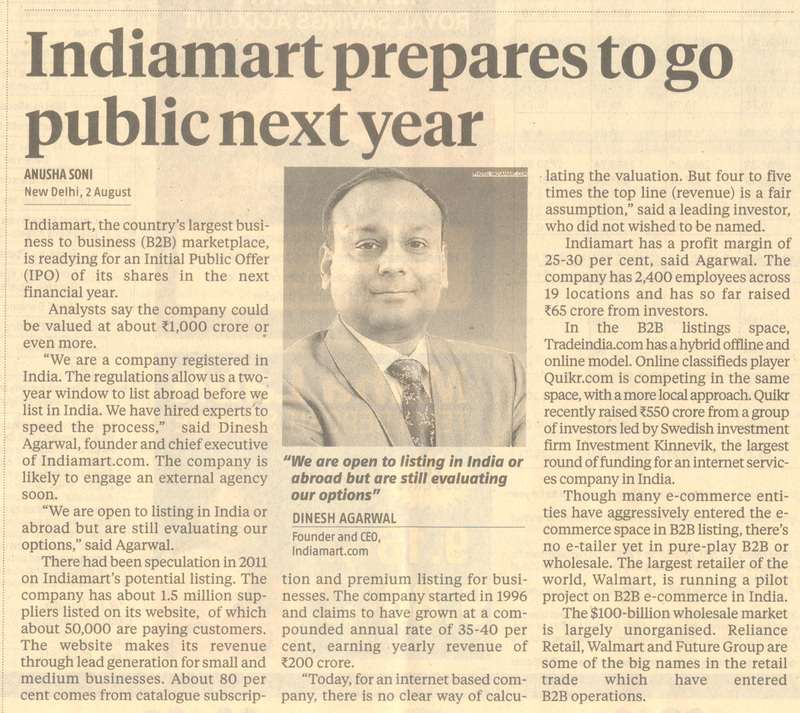 Business Standard, Indiamart, the country’s largest business to business (B2B) marketplace, is readying for an Initial Public Offer (IPO) of its shares in the next financial year. Analysts say the company could be valued at about Rs 1,000 crore or even more. “We are a company registered in India. The regulations allow us a two-year window to list abroad before we list in India. We have hired experts to speed the process,” said Dinesh Agarwal, founder and chief executive of Indiamart.com. The company is likely to engage an external agency soon. “We are open to listing in India or abroad but are still evaluating our options,” said Agarwal. There had been speculation in 2011 on Indiamart’s potential listing. The company has about 1.5 million suppliers listed on its website, of which about 50,000 are paying customers. The website makes its revenue through lead generation for small and medium businesses. About 80 per cent comes from catalogue subscription and premium listing for businesses. The company started in 1996 and claims to have grown at a compounded annual rate of 35-40 per cent, earning yearly revenue of Rs 200 crore. “Today, for an internet based company, there is no clear way of calculating the valuation. But four to five times the top line (revenue) is a fair assumption,” said a leading investor, who did not wished to be named. Indiamart has a profit margin of 25-30 per cent, said Agarwal. The company has 2,400 employees across 19 locations and has so far raised Rs 65 crore from investors. In the B2B listings space, Tradeindia.com has a hybrid offline and online model. Online classifieds player Quikr.com is competing in the same space, with a more local approach. Quikr recently raised Rs 550 crore from a group of investors led by Swedish investment firm Investment Kinnevik, the largest round of funding for an internet services company in India. Though many e-commerce entities have aggressively entered the e-commerce space in B2B listing, there’s no e-tailer yet in pure-play B2B or wholesale. The largest retailer of the world, Walmart, is running a pilot project on B2B e-commerce in India. The $100-billion wholesale market is largely unorganised. Reliance Retail, Walmart and Future Group are some of the big names in the retail trade which have entered B2B operations.